Yeah, I thought it was probably a high stick. I thought that we got better as the game went on. I thought we started a little bit slow. I thought their forwards had lots of speed, it gave us some trouble. I think, again, those specialty teams, they get a shorty, they get a power play goal on us, and five-on-five we were playing pretty good hockey. That’s not the area that’s hurting us. It’s the specialty teams that are hurting us. I thought he had flashes. I thought he made a couple good hits. I thought he showed a little bit of skill in the offensive zone. For his first game, I was happy with him. We know they’re good. Like, they’ve scored  shorthanded goals, so we know that. Before we started today, we knew we had to be careful. That puck came out halfway, the D didn’t know if he could get it or not, so he had to back off. But we had some chances. I think our power play’s been getting better. The kill’s been getting better, too. They scored with nine seconds left in the kill. Quickie loses his stick on it, and if he has his stick, he probably makes that save. Well, I thought it was high when I saw it. But still, when it goes in, it’s good to see it go in, but I thought it was probably high. Obviously you want to get more shots. I don’t know what we ended up with, but a lot of it came from late in the game, so you’ve just got to play a lot more minutes like we did the last five to seven minutes. You could tell it was desperation there and it’s just we’ve got to play like that for 60 minutes. Well, I don’t know, you’d have to ask them what’s so good about it. I just don’t think we obviously made enough plays to get a goal. It was exciting. The whole situation that I was in, I hadn’t been on the ice in about three days so it took a couple shifts to get my legs under me and kind of get confident with the puck a little bit, but I thought we got better as the game went on and we just came up short. He’s a big guy. That one you’re talking about it was at the end of a shift, just ran out of gas, but it was a good opportunity. You’d like to see those ones go in or maybe get a rebound off of that towards the end of the shift. But he played well. I think we could’ve made it a little bit harder on him. He’s a big guy, but it’s kind of hard to screen him sometimes. We had some good looks, it’s just we couldn’t cash in. I thought we did some really good things. In the second period, I thought we really took over the game there, other than the penalties. Got some momentum and got some good looks and just kind of comes down to burying some of those chances we get. You’re not going to get very many in a game so when you do get ‘em, it’s important to cash ‘em in. So-so. A lot of the teams nowadays play the same systems with a couple tweaks here and there, but just kind of figuring out some guys’ tendencies. But it’s not my first time going onto a new team, so I kind of know what to expect a little bit, but it’s never easy coming here kind of right out of nowhere. But it’s the way of the league, I guess, and you’ve got to be ready. –With the loss, Los Angeles fell to 89-102-36 all-time against the Arizona franchise, a record that includes a home mark of 49-47-17. The Kings are 2-5-1 in their last eight home games against the Coyotes. These teams have three games remaining: December 27 at Staples Center and March 9 and April 2 at Gila River Arena. –With the loss, Los Angeles fell to 5-11-1 agianst the Western Conference, 3-5-1 against the Pacific Division, 3-4-1 in one-goal games, 1-15-1 when their opponent scores first, 1-11-1 when trailing after one period, 0-13-0 when trailing after two periods and 3-7-0 when outshooting their opponent. –Since their 1967-68 inaugural season, the Kings (10-17-1) have accumulated fewer that 21 points through 28 games seven times: 1969-70 (6-19-3), 1970-71 (8-16-4), 1971-72 (5-22-1), 1983-84 (7-16-5), 1985-86 (7-17-4), 1987-88 (7-17-4) and 1998-99 (8-17-3). –Over the last 14 games, dating back to the home loss to Minnesota on November 8, Los Angeles has gone 4-for-37 on the power play and 28-for-43 on the penalty kill. — The Kings have scored zero goals or one goal (excluding shootout goals) in 11 of 28 games this season. –Including playoff games, Los Angeles surpassed 30,000,000 fans in franchise history with tonight’s crowd of 17,203. –Lawson Crouse recorded Arizona’s league-leading 11th shorthanded goal of the season. They have scored at least 11 shorthanded goals over an entire season twice since 1995-96: 14 in 1999-00 and 11 in 2007-08. They lead the league with 11 shorthanded goals, a 90.0% penalty kill and eight power play goals against. –The Kings attempted 59 shots (26 on goal, 18 blocked, 15 missed). The Coyotes attempted 50 shots (20 on goal, 18 blocked, 12 missed). Anze Kopitar, Brendan Leipsic, Tyler Toffoli and Jordan Oesterle tied with a game-high four shots on goal. –Los Angeles won 36-of-61 faceoffs (59%). 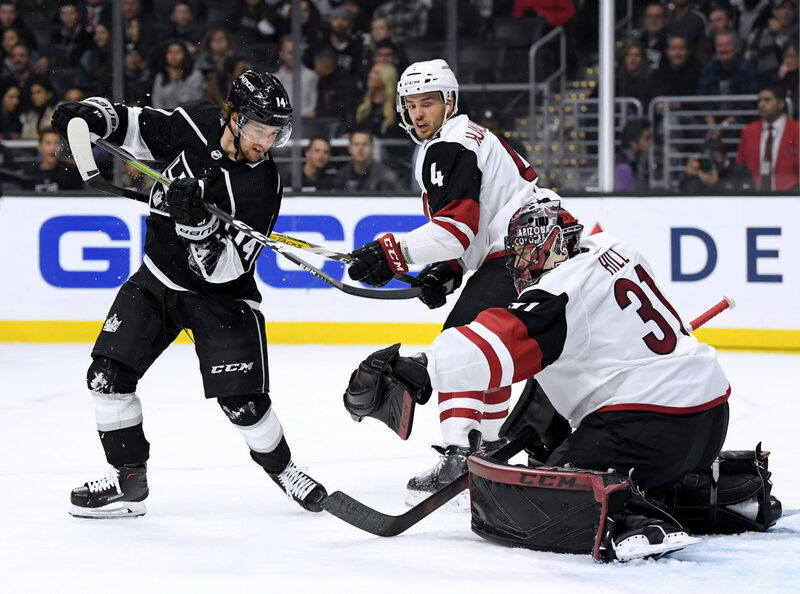 Adrian Kempe won 7-of-10, Michael Amadio won 1-of-1, Anze Kopitar won 15-of-24, Dustin Brown won 0-of-1, Nate Thompson won 1-of-4, Tyler Toffoli won 2-of-2 and Jeff Carter won 10-of-19. The Kings have won the majority of faceoffs in 17 of the last 23 games. The Kings are scheduled to practice at 11:00 a.m. Wednesday at Toyota Sports Center.